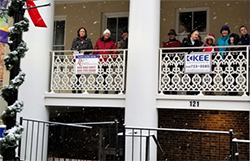 OSLC members and friends gathered to sing Christmas carols as part of Winchester’s Holly Jolly Celebration in Old Town Winchester on Saturday, December 9, 2017. We brought the gospel of Jesus Christ in tunes familiar to many, including our opening song, Joy to the World. It was a joy to see community members join along in the singing as they walked by or stopped to listen. It was a snowy day in Winchester as can be seen in the pictures below. Thank you to the OSLC members who braved the weather and made it a successful outing. To view local coverage of the event and OSLC carolers in action, visit localdvm.com, or click the image below.